Advantage II (Imidacloprid & Pyriproxyfen ) is the next generation of the original topical pest control as developed by Bayer. Advantage II kills all flea life stages including flea eggs and larvae to prevent infestation. The addition of the compound called Pyriproxyfen has added an extra dimension to the flea control than offered by Advantage. 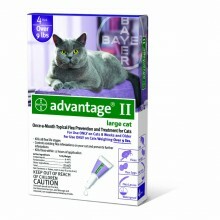 Advantage II is a once-a-month topical flea treatment for cats & kittens 8 weeks and older. Kills 98-100% of the fleas on cats within 12 hours. Easy to apply. Apply Advantage II once a month every month. On cats, apply to skin on neck at the base of the skull.